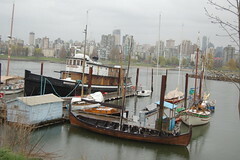 Come 2009, the museum that’s been situated at the water’s edge of Vanier Park at Kitsilano Point will be closing. This museum has been around for ages and it’s sad that another Vancouver cultural landmark is disappearing. Right now they’re fighting to find a way to preserve the vast collection and safely transition it to a new location, which looks like it may make its way over to North Vancouver. The biggest piece would be the St Roch which itself is actually a National Heritage Site. The boat has been here since 1958 and I hope they find a safe way to move and keep it so many others can enjoy its history. More information on the situation between the city and the Maritime Museum Society here.